Official Football Manager Hints and Tips which are applicable across both the full FM PC game mode and FMC. 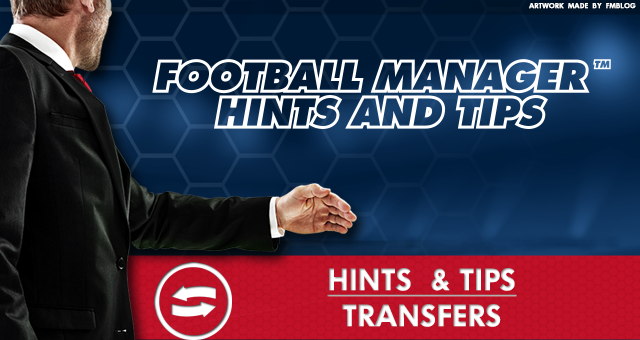 Let's take a look at Transfers Hints and Tips for FM. Players who are transfer listed are generally available at a knock-down price and are easier to sign. When approaching to sign a player on a free-transfer who is under the age of 24, the buying club will have to pay the selling club compensation. All incoming and outgoing transfer dealings can be handled within the ‘Transfer Centre’, which easily allows you to see all the important transfer details on one screen. Signing a player with a massive reputation can provide a commercial windfall through shirt sales. A player may be more willing to sign for a club if they are one of his favourite teams. If you offer an injured player to clubs, they are less likely to show interest until the player is over his injury. A club may have more luck in signing a player if they are one of his favoured clubs. Praising another manager in the media and building friendships with other managers may help your chances of having a transfer bid accepted for one of their players. Making enemies with other managers by openly criticising them may damage your chances of having a transfer bid accepted for one of their players. Should you wish to sign a player who is also interested in joining your club, you can sometimes unsettle him by ‘declaring interest’, which can make it easier to sign him in the long run. Be careful when declaring interest in a player as you can unsettle those at your club who play in the same position. When sending a player out on loan, with the ‘Can be recalled’ clause active, a club can recall the player at 24 hours’ notice. If you are heavy favourites for an upcoming match, casting doubts on your team can sometimes make your side even more determined to prove you wrong. When sending a player out on a loan which involves a fee, the club cannot recall the player for the duration of the loan. When sending a player out on loan, a club can prevent him from becoming cup-tied by ensuring the ‘Can play in cup matches’ clause is not active. When trying to sign a player from another club who is on a long-term contract, be prepared that you may have to pay more than his estimated value to land him. To avoid losing your players to other clubs on free transfers, you should look to renew contracts for those who are in the final year of their deal. You can offer contracts to virtual ‘greyed out’ players from your own team. This is particularly useful if you’re a low profile club and in need of players. When managing a lower league club, you may be invited to an exit trials match. At this match, players released by their club will be playing to showcase their talents and hopefully pick up a new club. When you receive news that you have successfully signed a player, you can immediately place them in the correct training schedule by clicking the ‘Player Training’ button at the bottom of the news report. You can find out which players a club is prepared to loan out by browsing to their Overview screen and clicking ‘Get Loan Report’ from the actions menu. You can reject or accept multiple transfer bids for the same or different players at the transfer centre. Use CRTL or SHIFT to select the desired players and select ‘Accept’ or ‘Reject’. To increase your chances of selling a player, go to his profile and click ‘Offer To Clubs’ from the ‘Transfer’ button. If you offer too many of your players to other clubs in a short space of time, you may damage your team’s morale as other players become worried that they’re next in line. Setting a player’s squad status to ‘Not needed by the club’ will increase the chances of the player agreeing terms with another club. The game clock will stop at more regular intervals on transfer window deadline day to give clubs a chance to rush through last-minute deals. Trialists are not allowed to play in competitive matches. They are only eligible to play in friendly games or reserve team fixtures. You can sign a player that has played competitive matches for two different clubs in the space of a year, but he will not be eligible to play until that year has passed. Football Manager transfers hints and tips that will help you during signing or selling players in the game.